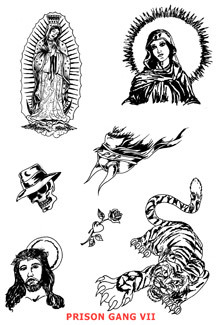 This sheet contains latino: Madonna, Madonna/Guadalupe, Jesus, Rose, Heart, Latino Skull, and Tiger. And white: Viking, Tiger, Rose and Heart. Sold by the sheet only.